Welcome to Baker Bay Bead Co's Bead Store and Supply! Welcome to Baker Bay Bead's Online Catalog! Baker Bay Bead Co. has thousands of beads for hundreds of projects. We feature beads made of glass, bone, metal, stone and shell in many sizes and styles. Specializing in supplies for Native American Regalia. 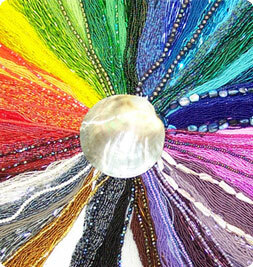 We have an extensive selection of Delicas, Charlotte Cuts, Seed Beads, Hex Cuts, Bugles, Faceted, Rounds and Crow Beads. Please enjoy looking through our catalog. If you don't see what you're looking for please let us know. Check the Show Schedule for up coming shows! — Article by Bud Heykamp of Baker Bay. These are the folks we enjoy working with. Click here to see their links. Where in the world is Baker Bay Bead Co? Baker Bay Bead Co is located in Dorena, OR. Dorena is a few miles east of Interstate 5 at Cottage Grove Exit 174. Store Hours: Mon. - Sat. 10am - 5pm Pacific Time.